As you plan your wedding ceremony, you might want to look at several sample wedding vows to help you get started. You can choose from traditional wedding vows, or your vows can have a more personal or even unusual touch. Whatever type of wedding vows you choose, you'll want to make sure they reflect the true feelings that are shared between you and your sweetheart. Today, many couples choose to write their own wedding vows for the ceremony. While they may take their ideas from traditional vows, they want to incorporate their own words and feelings into the ceremony. This isn't a time to ad lib, however. You and your fiancée will need to take some time to write down exactly what you want to say. Take your time-Your wedding begins a lifetime of love, laughter, and times of difficulty together. Your vows should reflect your dedication and commitment to each other. It's important that you take your time in order to express what you really feel. want to write, it's always a good idea to write your first drafts alone. Then, you can compare what you want to say, and maybe do a few rewrites until you've perfected your vows. Add favorite quotes and/or phrases-These may come from scriptures, poetry, or even your Aunt Betsy, etc. As long as they reflect what you feel, it really doesn't matter where they come from. Now that you've gotten an idea of what you want your vows to say, it's time to take a look at some free sample wedding vows. You might want to use all or only a part of these vows. Remember, it's your wedding, and you want it to be perfect. The vows are actually the most important part of the ceremony. Sure, you want the flowers, dresses, and cake to be great, but what you and your fiancee want to say to each other is the focus of this ceremony. Man ___crystal___, as we stand before both God and man, making public our commitment to one another, I wish to make it known that I recognize first of all God's authority over my life which is exercised from His loving heart. He has chosen me to be one of his own, and He is now my life. I recognize also that He has blessed me and entrusted to me your life as a free gift that I have not earned. In recognition of these things, crysral____ I purpose to love you with His love, to provide for your needs through His enablement, and to lead you as He leads me, as long as He give us life together, regardless of the circumstances. As Psalm 34:3 expressed my heart when I asked you to marry me, so it expresses my heart now: "O magnify the Lord with me and let us exalt His name together." Woman On this special day, _willie____, I am reminded of the verse James l:17 which says, "Every good thing bestowed and every perfect gift is from above, coming down from the Father of Lights with whom there is no variation or shifting shadow." With a gift such as you, I know that many new responsibilities face me. In I Corinthians, it explains "It is required of a steward to be found trustworthy." I cannot do this on my own strength, ____willie___, but by God's grace and power working within me I desire to be trustworthy as your wife by following your leading submissively, even as unto Christ, loving and serving you in all circumstances as long as He give me life on this earth. Man I love you, crystal______, and I thank the Lord for the love that has bound our hearts and lives together in spiritual fellowship of marriage. I will love, honor and cherish you always. As we enter upon the privileges and joys of life's most holy relationship, and begin together the great adventure of building a Christian home, I will look to Christ as Head of our home as I have looked to Him as Head of the Church. I will love you in sickness as in health, in poverty as in wealth, in sorrow as in joy, and will be true to you by God's grace, trusting in Him, so long as we both shall live. Woman I love you, ___willie___, and I thank the Lord for the love that has bound our hearts and lives together in spiritual fellowship of marriage. I will love, honor, cherish and obey you always. As we enter upon the privileges and joys of life's most holy relationship and begin together the great adventure of building a Christian home, I will look to you as head of our home as I have looked to Christ as Head of the Church. I will love you in sickness as in health, in poverty as in wealth, in sorrow as in joy, and will be true to you by God's grace, trusting in Him, so long as we both shall live. Man I, _crystal_____, take you __crystal____, to be my wedded wife, to have and to hold, from this day forward, for better, for worse, for richer, for poorer, in sickness and in health, to love and to cherish, till death do us part, or the Lord comes for His own, and hereto I pledge you my faithfulness. Woman I, _willie____, take you _willie_____, to be my wedded husband, to have and to hold, from this day forward, for better, for worse, for richer, for poorer, in sickness and in health, to love land to cherish, till death do us part, or the Lord comes for His own, and hereto I pledge you my faithfulness. Man I _____, take you ______, to be my wedded wife. To have and to hold, from this day forward, for better, for worse, for richer, for poorer, in sickness or in health, to love and to cherish 'till death do us part. And hereto I pledge you my faithfulness. Woman I, _____, take you ______, to be my wedded husband. To have and to hold, from this day forward, for better, for worse, for richer, for poorer, in sickness and in health, to love and to cherish, 'till death do us part. And hereto I pledge you my faithfulness. Man ______, I love you. Today is a very special day. Long ago you were just a dream and a prayer. This day like a dream come true the Lord Himself has answered that prayer. For today, ______, you as my joy become my crown. I thank Jesus for the honor of going through time with you. Thank you for being what you are to me. With our future as bright as the promises of God, I will care for you, honor and protect you. I lay down my life for you, _____, my friend and my love. Today I give to you me. Woman ______, I love you and I know you love me. I am confident that God has chosen you to be my husband. It is my prayer and desire that you will find in me the helpmeet God designed especially for you, and in confidence I will submit myself unto your headship as unto our Lord. Therefore, _____, I pledge to you my life as an obedient, faithful and loving wife. Whither thou goest I will go, whither thou lodgest I will lodge, Thy people shall be my people, And thy God my God. 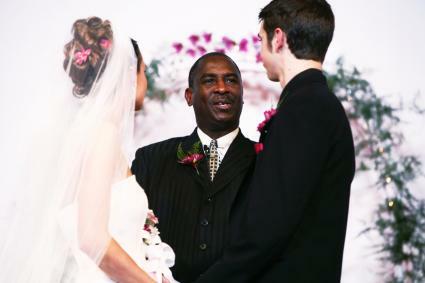 Some couples want to steer clear of the traditional wedding vows that are often exchanged at wedding vows. Whether you like your vows short and sweet, or you just want to declare your love a little differently, the following sample wedding vows can help you say what you really feel. On this day, (month, day, year), I, (name), join myself to you (name), before this company. May our days be long, and may they be seasoned with love, understanding and respect. To marry the person you have set your heart upon is a joy unparalleled in human life. (Name), take this ring as a sign of my faith and my commitment to our love, and share this joy with me today. Where there has been cold, you have brought warmth; where my life was dark, you have brought light. (Name), I pledge before this assembled company to be your (husband/wife) from this day forward. Let us make of our two lives, one life, and let us always honor and respect each other. I came to this place today as a (man/woman) standing along; I will walk from it by your side. Today I cross the threshold with you and enter into a new and lasting lifetime commitment. (Name), I commit myself to you as your (husband/wife). (Name), our miracle lies in the path we have chosen together. I enter this marriage with you knowing that the true magic of love is not to avoid changes, but to navigate them successfully. Let us commit to the miracle of making each day work - together.